← Yoga Classes Starting on June 2nd in Central London! Upcoming Flash Mobs to Keep an Eye out For! Just in case you never made it to the Yoga Flash Mob in May…..not to worry! The Evolve Wellness Centre are organizing, not 1, but TWO more flash mobs! Details: Arrive before 6:20pm and hang around the area minding your own business. At 6:23pm (on the dot) a leader will sit down and begin to meditate on her own. Please continue to look inconspicuous during this time. Allow her to do sit for at least 30 seconds and then join in at staggered times within the first 2-3 minutes. The Flash Mob will last a 20 minutes exactly. At 6:43pm, the leader will get up and walk away. Please disperse and walk your own separate ways. We want to confuse and bemuse the public and leave them in bewilderment as to what just happened. What to Bring: Yourself and your friends. Attire: Business or everyday clothing. Register: Please just let them know if you’ll attend by clicking attend on their facebook event page. Next up is going to be awesome & on a much bigger scale than the last one – this time we’re going GLOBAL! Evolve Wellness Centre is partnering with yoga studios in cities across the world to create a Global Yoga Flash Mob on Tuesday, 13th September. Flash Mobs are a large group of people who gather “spontaneously” in a public place, perform an unusual act then quickly disperse. By having it at an odd time, it helps create the element of surprise for those not participating. The purpose of this Yoga Flash Mob is to create an awareness of yoga on a global scale. Details: Arrive before 6:20pm and hang around the area minding your own business. At 6:23pm (on the dot) a leader will go through the Sun Salutation series once on their own. Please continue to look inconspicuous during this time. Allow them to do the series once, then feel free to join in at staggered times within the first 2-3 minutes. After 18 minutes of practice, the Sun Salutations will finish and will be followed by 2 minutes of meditation. The Flash Mob will last 20 minutes exactly. At 6:43pm, the leader will leave. Please disperse and walk your own separate ways. We want to confuse and bemuse the public and leave them in bewilderment as to what just happened. What: We will be doing 20 minutes of Sun Salutations (A + B series). You can also just follow along at the Flash Mob. What to Bring: Please feel free to bring your own mat but do not lay it down until after 6:23pm. It will seem more spontaneous if you do not use a mat, but for health concerns, we understand if you choose to use one. Attire:Business or everyday clothing. Just be sure you can move in it. This Global Flash Mob is spearheaded by Evolve Wellness Centre (www.evolvewellnesscentre.com). If you want organise your city in the Global Yoga Flash Mob, please contact info@evolvewellnesscentre.com. Hope you’re all having a great Bank Holiday Monday…If you’re bored & not quite sure what to do…you can always watch Enlighten Up! 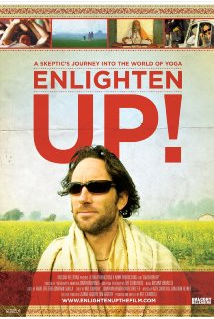 The main characters are Kate, a Boston-based documentarian with a rock-solid confidence in the transformative power of yoga; & her subject Nick — a Manhattan journalist — who espouses deep-seated skepticism and resistance to yoga as a system of thought and physio-spiritual regeneration. Nick’s journey is an interesting one, what i found most interesting are all the Yoga Masters he meets along the way & the discussions he has with them…including Sri K Pattabhi Jois. 1 Response to Upcoming Flash Mobs to Keep an Eye out For!